Police in Worthing searched 25 people in one day as they continue to crack down on county lines drug dealing. Officers were out in force in Thursday in an effort to stem the flow of drugs coming into the seaside town. Chief Inspector Miles Ockwell described it as a 'significant operation' and residents reported seeing large numbers of police. This morning Sussex Police confirmed that 25 stop and searches were carried out as part of the day of action. Two men were arrested on suspicion of possessing Class A drugs and a young woman was arrested on suspicion of possession of a Class A drug with intent to supply. 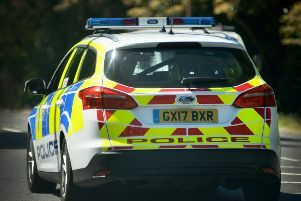 Johnathan Mateer, 47, of Robinson Close, Lancing, has been charged with possession of heroin and crack cocaine and is due to appear at Worthing Magistrates' Court on March 22, police confirmed. The other man, 47, from New Addington in South London, was released under investigation. The 23-year-old Goring woman arrested on suspicion of possession of a Class A drug with intent to supply accepted a formal police caution. “County lines activity is known to come from bigger cities, and to use vulnerable people to carry out work on behalf of gangs. "It is our job to keep the community safe by promoting the hostile environment that Sussex is for drug supply. We will continue work to stem the flow of drugs throughout the year. County lines is a particularly harmful and violent tactic used by big city drug gangs and is being seen across the UK. The term refers to a strategy used by gangs from large urban areas such as London, who use children and young people and vulnerable adults to carry out illegal activity on their behalf. The groups operate a dedicate drugs 'line' as part of their business. Police work to combat illegal drugs in Sussex continues under the 'Fortress' brand, launched to encompass all their drug-harm reduction work. Ch Insp Ockwell said last month that his officers are making real progress against big city gangs selling drugs on our streets. Anyone with information about suspected illicit drug activity in their community can report details online or call 101, quoting Operation Fortress. Alternatively details can be passed anonymously via the independent charity Crimestoppers online or by phoning 0800 555 111. For further information about police work to combat County Lines activity in Sussex see the force website.